The band Meeka consists of singer/songwriters Romeeka Gayhart and Terry Gayhart. This daughter/father duo have been writing and performing since Romeeka’s childhood days. She makes quite an impact with her unique presence,voice and lyric content. The collaboration between the two guarantees an eclectic mix of styles. Filling out the rhythm section are Wyatt Latimer on drums and Drew Washington on bass. The band is honored to donate a performance to the Sound Off for Veteran’s Day cause. Terry is a member of the original rock outfit Shift Seven who have performed for this Wounded Warrior Project for the last two years. This year it wasn’t possible so “Meeka” was asked to step in. Mycenea Worley is a singer/songwriter who regularly plays clubs, festivals, and benefits throughout central Pennsylvania. Her performances usually feature a nice blend of original songs, popular covers, and covers done with her unique arrangement, and always feature her enthusiastic smile, friendly demeanor, and outgoing personality. She sings from the depths of her heart and soul and the music itself slightly deviates from her upbeat and outgoing persona. It heartfelt with a bit of a bent towards the folk rock edge. 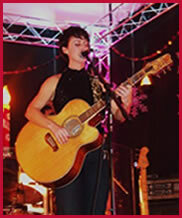 Mycenea released her debut, five-song EP titled Love in 2009, an enjoyable showcase of Mycenea’s songwriting talent and range. Material for a follow-up album is currently being recorded and should be out in the coming year. In 2009 and 2010, Mycenea Worley was voted “Best Female Vocalist” at the 717 Music Awards, a testament to her brilliant talent. Further, Mycenea has donated her talents to each of the City Island Sound Off events and we look forward to her performance at Sound Off for Veteran’s Day.